The Economic Freedom Fighters notes the political developments in Zimbabwe and believe that as a revolutionary Pan Africanist Movement, we will not be on the fence when major political developments are unfolding in our neighbouring country. On various occasions, the EFF has always expressed clear perspectives on key political developments in the African continent and the world. The EFF is of a strong belief and view that President Robert Mugabe must hand over political power to the next generation and should not allow his name to be used for the further degeneration of a country he led to political liberation. Zimbabwe has experienced a lot of pain and destabilization over of the past two decades, lost its currency and displaced millions of its citizens due to economic hardships. The EFF appreciates that some of the pain caused in Zimbabwe was due to imperialist actions, but a significant component of this was self-inflicted. President Mugabe cannot insist on remaining in power even when he is physically incapable of doing so. 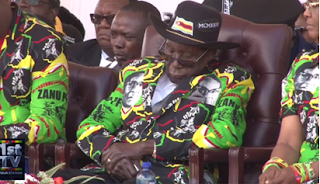 Opportunists around him, particularly his close relatives and wife have taken advantage of president Mugabe and used his power and struggle credentials to purge political opponents. Following the reality that all else has failed in realizing a post-Mugabe era, the Zimbabwe Defence Force is within its rights to protect Zimbabwe from factions that are opportunistically using Zimbabwe for self-enrichment to the total disregard of the rule of law. The ZDF should, therefore, be encouraged and allowed to lead a non-violent transition which will culminate in free, fair and democratic elections, and which will in the process respect the autonomy of the judiciary. It is high time that Zimbabwe transits to a post-Mugabe era and all progressive forces all over the world should support the transition. Further degeneration of Zimbabwe should not occur and we have an obligation to protect Zimbabwe from such. The ZDF should make sure that there is no loss of life during the transition, but should decisively suppress agent provocateurs who will try to undermine the long overdue transition. Finally, we call on the South African government to prepare to welcome President Mugabe for political asylum. He must be allowed to come to South Africa so that a peaceful transition can indeed take place. We must do this to aid peace allowing Zimbabweans to immediately stabilize their country and institutions for the sustainable civilian rule and a better future.